Retsu Takahashi had no time to think. 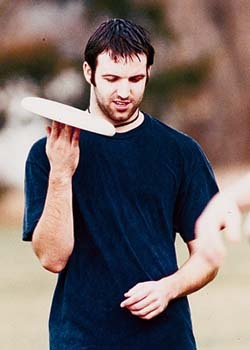 Just move, go to the errant flying disc the way he'd trained himself in four years of Oberlin Ultimate Frisbee. Four years that had come down to this, an absurdly wet Sunday game against the corn-fed jocks of Madison. The winners to reach the 1992 national championships, the losers to seek consolation and better luck next time. Everyone mud-streaked and run ragged; Oberlin up by one and needing one point to win. Maybe Madison misjudged the Oberlin team at first, snap judgements being easy. The way it's easy to misjudge a college, miscast a student, or misinterpret a sport's style and thereby miss its substance. Takahashi '92 for one, was a lean, ponytailed women's studies major with a Bugs Bunny bandanna and hair adorned in a top knot. He was the very picture, perhaps, of peaceful Oberlin P.C.-until he ferociously launched himself through a tangle of Madison players and seized from the air a dying pass. His ankle blew out when he hit the ground, but he held on to the 175-gram spinning disc. Pain was the price he paid for making the catch that set up, once he'd hobbled to the sidelines and play resumed, an emphatic 18-yard pass from a substituting Josh Colangelo-Bryan '92 to Reggie Oh '92 in the endzone. The Oberlin Flying Horsecows-comically named, intensely focused-had earned their way to the Nationals for the first time in the colorful history of Oberlin Ultimate. For a ten-minute eternity, 30 to 40 Oberlin players and fans piled atop one another in the cleat-clawed endzone, flesh and mud and tears mingling in crazy joy. "It was," said team co-captain Tom Keck '92, "definitely one of the happiest moments of my life." In the standard hierarchy of college athletics, Oberlin is appropriately Division III. Sports have their place, but the agate-type heroics are usually sequestered somewhere behind learning and labor. And for those who don't know any better, Ultimate Frisbee is strictly, well, Division Beyond: its very name a bit of oxymoronic hubris, with players prone to a gleaming-eyed evangelizing that would make Charles Finney blush. Cloaked in so many misconceptions, adorned with its own idiosyncratic style, Ultimate is an Oberlin treasure too easily missed. So pause on the sidelines for just a moment and observe the unfolding play. Peel back the veils of pure style, past the deceptively unmartial team names like the Oberlin Flying Horsecows and Praying Manti, the Swarthmore Swarming Earthworms, Cornell Rockin' Buds, and Wesleyan Nietzsch Factor. Peer past the pulsating sideline music, the chants and disorienting absence of referees, or adult coaches. Go on, past all the flavorful but distracting externalities, 'til the thing itself becomes manifest. It's sport, pure and simple. Young athletes are spending themselves silly on a grass field 70 yards long by 40 yards wide. Players, seven on each team, are trying to score by passing a Frisbee to a teammate maneuvering through the endzone. The offensive players are trying to shake off their defenders by running fluent, continuous patterns drawn from the Esperanto of field sport-down-and-outs, down-and-ins, going-long-while the pivoting player with the disc looks for an open ally. Players can't run with the disc, but when a team is offensively flowing there's no stopping it: passes swing back and forth across the field, curving up the sidelines and into the endzone like poetry with a punch-line. It's a fast-moving, jazzy hybrid of a game, filled with athletic improvisations. The players are sprinting ceaselessly like soccer midfielders, diving fearlessly like football wide receivers, stepping heedlessly on air like basketball forwards. They catch, pivot, fake, throw, sprint, dive, leap, block, run and run and run some more. "The great thing about Ultimate over the others were the many facets of sports play incorporated into this one game," said Moshe Imel '92. "It was quite a bit more demanding than any sport I've played and required a level of finesse that the others didn't approach."